MAY 10TH SCREENING IS FREE, TICKET REQUIRED. 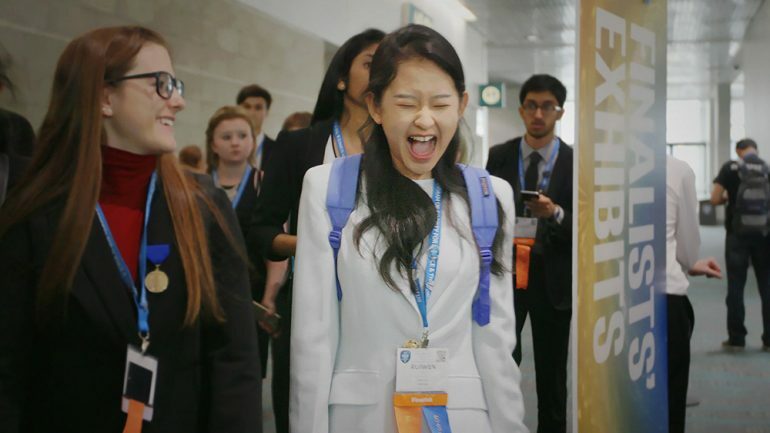 Directors Cristina Costantini and Darren Foster take us on an inside look at the competitive world of the Intel-sponsored International Science and Engineering Fair (ISEF), where the best and brightest young STEM minds from all over the world gather and battle it out. Following a diverse group of nine high school students from their various hometowns as they ready for the big competition, SCIENCE FAIR offers us an optimistic examination of our global youth’s collective intelligence, ingenuity, and investments in using science and tech to help solve many of our world’s ongoing problems from environmental pollution to cancer. From Louisville, KY, Anjali’s confident determination to impress with her arsenic-detection device goes head to head with the dynamic trio of Ryan, Harsha, and Abraham’s work on next-gen cardiac arrest research while Dr. McCalla’s Jericho, NY group of science kids do intense prep under their research mom. Meanwhile Kashfia, a young Muslim woman from Brookings, South Dakota, studies brain function and the adverse risky behavior of teens and struggles to find a faculty sponsor in her sports-oriented school. Myllena and Gabriel, two teens from an impoverished, small town in Brazil, hope their research will lead to a potential cure for the Zika virus. Ivo, a German aeronautical wunderkind, builds a flying wing with better fuel-efficiency and stability while Robbie, an aimless, whip smart computer programming West Virginia teen, wants his win to open doors to the best colleges. Cristina Costantini directed and produced SCIENCE FAIR, her first feature documentary. She won an Alfred I. duPont–Columbia University Award and has been nominated for two Emmys. Before attending Yale University, Cristina was a science fair nerd. As a freshman in high school, she placed fourth in her category at the international science fair—it’s all been downhill from there. Darren Foster directed and produced SCIENCE FAIR, his first feature documentary. He’s won a Peabody Award and an Alfred I. duPont–Columbia University Award, and he’s received several Emmy nominations as a TV producer and journalist. Darren co-founded Muck Media, a production company based in Los Angeles and Lisbon. His high school science fair project proved Venus flytraps (Dionaea muscipula) like hamburgers.